Rated 4.2 out of 5 stars.5 total votes. Accent tables add the perfect finishing touch to your room. Place next to a side chair, in an entryway, or that corner you don’t know what to do with. The Andre Table is the piece for you! Handmade from solid wood by master craftsmen, each table is unique. Display a small lamp on this table along with some treasured photos and keepsakes and you’ve created a beautiful vignette! Product Care Wipe clean with a damp cloth. From floral prints to muted wood tones, One Allium Way brings a bit of French country-charm to any home. When you buy a One Allium Way André Dining Table online from Wayfair, we make it as easy as possible for you to find out when your product will be delivered. Read customer reviews and common Questions and Answers for One Allium Way Part #: ONAW3903 on this page. If you have any questions about your purchase or any other product for sale, our customer service representatives are available to help. Whether you just want to buy a One Allium Way André Dining Table or shop for your entire home, Wayfair has a zillion things home. I really love this table. Love the natural wood color and the solid wood makes it so sturdy. I wanted a really small table in my nook area and it fits perfect. The table is the perfect size for a small breakfast area! It can be paired with casual metal chairs or more elegant tall-back chairs. Rated 4 out of 5 stars.16 total votes. 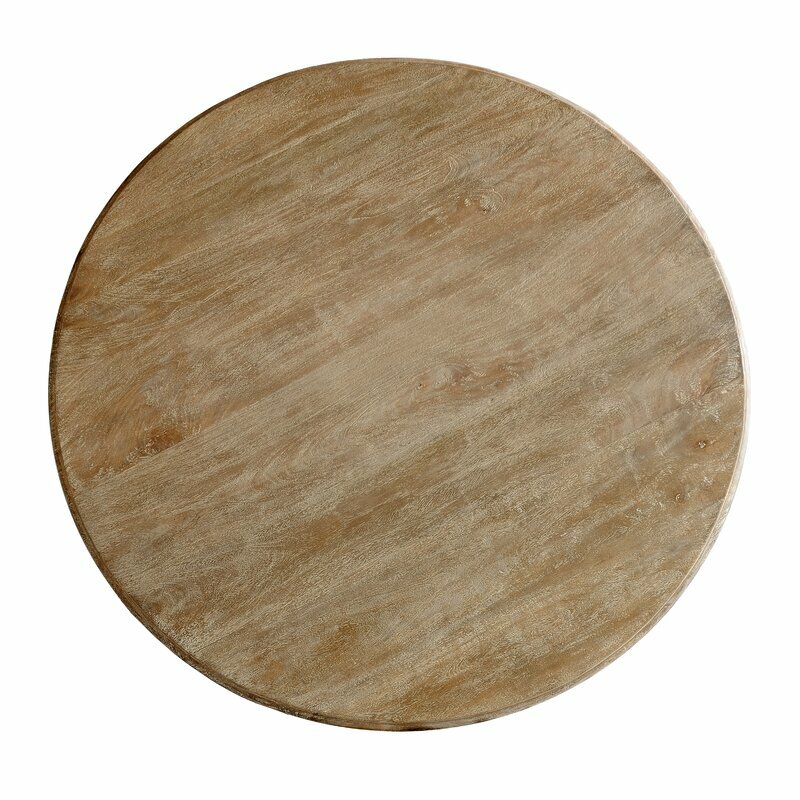 Casual Elements Venezia Round Dining Table brings casual elegance to your everyday dining. This solid wood pedestal table is meticulously handcrafted from plantation grown mahogany or mango wood. Whether you use this table to complement a traditional design or use it to accentuate a cozy cottage look, this dining table will be a handsome addition to your furniture collection. Set the stage for endless dinner gatherings with the addition of this dining table. Elegantly blending mixed materials for a modern look, slender metal legs hold up this wooden tabletop, encompassed by geometric-shaped detailing to create a dynamic dining experience. This Extendable Dining Table is the missing piece in your home! This cottage chic table comes with an 18" leaf, perfect for accommodating last minute guests. This round table features a light walnut finish on the table top, showcasing the natural grains of the wood; while the pedestal base is an antique white finish with distressed marks throughout. The table top features bevel edges, adding a classic touch to this already stunning table. Intricate design details on the pedestal base make this table a standout in your home. Complete the look of your table with the Dining Chairs from the same collection. With its traditional details and compact design, this dining table is sure to enhance any breakfast nook or small-scale eating space. Crafted from solid rubberwood, it features a pedestal-style base for looks and stability, while a butcher block top offers space enough for two to take meals. An unfinished look in a neutral hue displays the natural burls and grains of the wood, lending this piece even more classic charm. Distance from table top to the bottom of the apron is 2.5"
European elegance gets a rustic update in this handsome dining table. Crafted of pine hardwoods in a distressed dovetail gray finish, this tabletop strikes a round silhouette with chunky moldings and thick sides. Its architectural pedestal frame showcases carved open scrollwork supports on an X-shaped footed base, while wood stretchers increase durability and support. Perfect for everyday weeknight meals and weekend dinner parties with friends alike, this table comfortable seats four to six diners. This handcrafted item perfectly blends industrial hairpin legs with a beveled wooden top. The irregular beauty of its natural walnut combined with its simple elegant base creates a timeless, original design. Gorgeously blending a rich Polaris base with a relaxed Solana top, this Rimini Dining Table brings a focused stylishness to the home. Rated 4 out of 5 stars.18 total votes. Some of our best memories are created at our dining tables – they host our family dinners, holiday feasts and more. No matter the shape or size, they play an integral role in our home. Take this one for example: Crafted from solid and manufactured wood, this piece comes perched atop a turned pedestal base with bun feet, exuding traditional appeal in your space. Featuring a round top in a neutral hue, this piece is designed to seat up to four people after assembly.